Degrasyn (WP1130) is a selective deubiquitinase (DUB: USP5, UCH-L1, USP9x, USP14, and UCH37) inhibitor and also suppresses Bcr/Abl, also a JAK2 transducer (without affecting 20S proteasome) and activator of transcription (STAT). HEK-293 cells expressing Strep-CLASPIN were first arrested in S-phase with HU or in mitosis with nocodazole. Cycloheximide was then added to prevent further protein synthesis in the presence or absence of the USP9X inhibitor WP1130 and samples were harvested at the indicated times. A sample from the same cell line uninduced (U) was loaded as control. Cancer Res, 2016, 76(8):2384-93. Degrasyn (WP1130) purchased from Selleck. Protein expression by western blot analysis of cell lysates from MCF-7, TAMR-4 and 164R-7 cells treated for 3 days with vehicle (0.1% DMSO), 1 uM or 1.5 uM WP1130. Oncogene 2014 10.1038/onc.2014.351. Degrasyn (WP1130) purchased from Selleck. SF188, U251 and T98G glioblastoma cells were treated for 24 h with increasing concentrations of WP1130 under serum starvation. Whole-cell extracts were examined by Western blot for Usp9X, Bag3, Mcl-1, Bcl-2, Bcl-xL, XIAP and Survivin. Actin served as a loading control. Oncotarget, 2016, 7(11):12791-805. Degrasyn (WP1130) purchased from Selleck. The inhibitors of DUBs and UBE1 inhibited HSV-2 replication. HEC-1-A cells were either infected or not infected in the presence of WP1130 (2 ug/ml) or PYR-41 (20 ug/ml). Levels of ubiquitin conjugates, IκB-α, and gD were determined 24 h p.i. J Virol 2013 87(15), 8675-86. Degrasyn (WP1130) purchased from Selleck. USP9X activity regulates Mcl-1 expression. (b) A549 cells were plated in 10 cm tissue culture dishes and upon reaching 70% confluency were treated with 10 μg/ml CHX for 6 h or exposed to a combination of 7.5 μM WP1130 for 2, 4 and 6 h and 10 μg/ml CHX for 6 h. Mcl-1 and USP9X signals were then determined by western blotting. Proteins were quantified using UN-SCAN-IT. Those intensities of the signals of USP-9X and Mcl-1 are relative to Actin. BMC Cancer 2012 12, 541. Degrasyn (WP1130) purchased from Selleck. Am J Transl Res, 2018, 10(1):224-234. Degrasyn (WP1130) purchased from Selleck. WP1130 has an advantage over imatinib mesylate in that its activity is not inhibited by a variety of Abl kinase mutations, including T315I. Method: Cells are treated with increasing concentrations of WP1130 (0.08-10 μM) in 96-well plates. Plates are incubated at 37 °C for 72 hours, after which 20 μL of MTT reagent is added, and the plates are incubated at 37 °C for another 2 hours. Cells are lysed with 100 μL lysis buffer (20% sodium dodecyl sulfate [SDS] in 50% N, N-dimethylformamide adjusted to pH 4.7 with 80% acetic acid and 1 M hydrochloric acid; final concentration of acetic acid is 2.5% and hydrochloric acid is 2.5%) and incubated for 6 hours. The optical density of each sample at 570 nm is determined with a SPECTRA MAX M2 plate reader. Bartholomeusz GA, et al. Blood, 2007, 109(8), 3470-3478. Bartholomeusz G, et al. Cancer Res, 2007, 67(8), 3912-3918. Kapuria V, et al. Cancer Res, 2010, 70(22), 9265-9276. P22077 : USP7-selective, EC50=8.6 μM. IU1 : USP14-selective, EC50=4.7 μM. P5091 (P005091) : USP7, EC50=4.2 μM. TCID : DUB inhibitor for ubiquitin C-terminal hydrolase L3 with IC50 of 0.6 μM, 125-fold selective to L1. PR-619 : Non-selective, reversible inhibitor of the deubiquitinylating enzymes (DUBs) with EC50 of 1-20 μM. 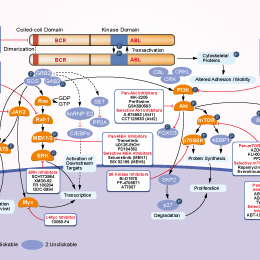 Features:A selective inhibitor of native and mutant Bcr-Abl. Features:A conformational control inhibitor of Abl1 and T315I Abl1.